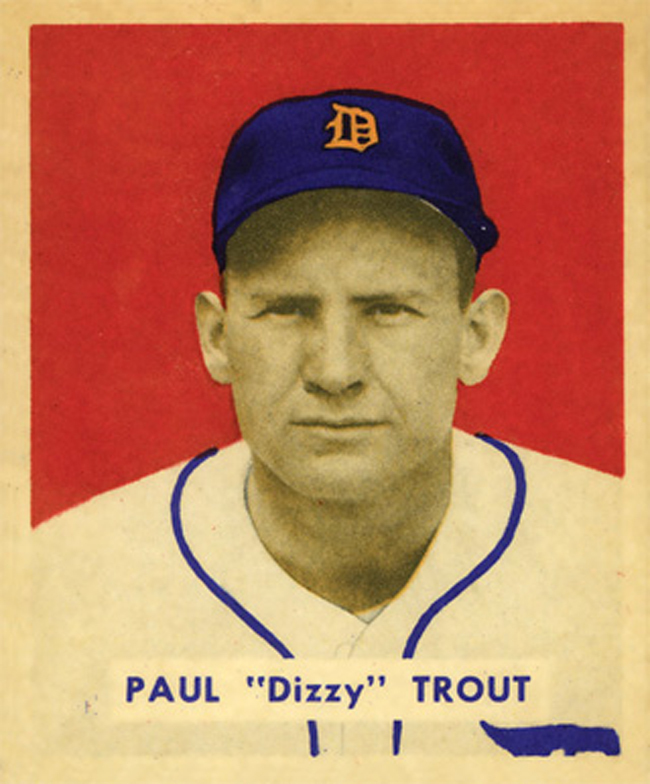 Paul Howard “Dizzy” Trout (June 29, 1915 – February 28, 1972) played for the Detroit Tigers for fourteen seasons, appearing in two World Series, in 1940 and 1945 (in which he had an ERA of 0.66 in the Series). I heard on the radio this morning an appropriate turn of phrase in lieu of Justin Verlander’s (“The Monarch”) performance in yesterday’s Game 1 of the World Series, and it goes something like this: The are two types of ball players. Humble ones and those preparing themselves to be humbled. There are various legends about how the Tigers got their nickname. One involves the orange stripes they wore on their black stockings. Tigers manager George Stallings took credit for the name; however, the name appeared in newspapers before Stallings was manager. Another legend concerns a sportswriter equating the 1901 team’s opening day victory with the ferocity of his alma mater, the Princeton Tigers. The earliest known use of the name “Tigers” in the news was in the Detroit Free Press on April 16, 1895. The truth is revealed in Richard Bak’s 1998 book, A Place for Summer: A Narrative History of Tiger Stadium. In the 19th century, the city of Detroit had a military unit called the Detroit Light Guard, who were known as “The Tigers”. They had played significant roles in certain Civil War battles and in the 1899 Spanish-American War. The baseball team was still informally called both “Wolverines” and “Tigers” in the news. Upon entry into the majors the ballclub sought and received formal permission from the Light Guard to use its trademark and from that day forth it is officially the Tigers. In short, the Tigers most likely wore stripes because they were already Tigers, rather than the other way around which is the conventional story. “Bless You Boys” — Rally cry coined (in sarcasm) by Al Ackerman, a Detroit sports anchor legend. Briggs Stadium — Tigers ballpark (1938–1960) named after plumbing fixture manufacturer Walter Briggs, Sr.
Navin Field — Tigers ballpark (1912–1938) named after Francis Joseph Navin principal owner of the Detroit Tigers in Major League Baseball for 27 years, from 1909 to 1935. He also served as vice president and acting president of the American League. In honor of our local team, the San Francisco Giants, and their amazing run to 2010, 2012, and 2014 World Series victories, I’ve put together an extensive list of Giants team nicknames, player nicknames and slang, past and present. Baby Giraffe — Brandon Belt (2011–Present); Giant first baseman who sports a long neck. El Caballo Loco — Angel Pagan (2012–Present); Crazy Horse! Fadeaway — A new pitch invented by Christy Mathewson (1900-1916), which later became known as the screwball. “Got Heeem'” — An expression coined by Giants pitcher Brian Wilson, employed, for instance, when an opposing baserunner is caught stealing. Kung Fu Panda — Pablo Sandoval (2008–2014); named by teammate Barry Zito for his rotund build and loveable nature. Los Gigantes — Spanish for Giants. Used on the team’s uniform on Cinco de Mayo of 2007. McCovey Point — At the northeastern portion of the China Basin Park, San Francisco, overlooking McCovey Cove. Panda — Pablo Sandoval (2008–2014); named by teammate Barry Zito for his rotund build and loveable nature. Panik Attack — Joe Panik (2014–present); this is Zinzin’s creation and recommended nickname for a truly amazing young player. The Bay Bombers — A geographic nickname, alluding to San Francisco, which is situated by the SF Bay. The Bays — Short version of The Bay Bombers. The Bulldozers / The Dozers – In reference to winning all six elimination games on the way to the 2012 World Series Championship, especially in the NLDS when they lost first two games at home and won all three elimination games in Cincinnati. Nobody in San Francisco actually calls them this. Perhaps Detroit, St. Louis, and/or Cincinnati fans did. The G-Men — A Giants team nickname and reference to nickname for a government agent. The Gnats — Used by Giants detractors, especially Dodgers and Athletics fans. The Misfits – Nickname for the 2010 Giants team that won the world series with a group of players that were not considered super stars… Also a play on the “SF” in “miSFits”, as seen on many bootleg shirts bearing the band logo of the same name. The Orange and Black — Reference to the team’s colors. The Orange Giants — Reference to the team’s colors. The Orange Nation — Reference to the team’s colors. The Stick — Candlestick, in San Francisco, home of the SF 49ers and Giants.